Seizing on Chapman Plaza’s appeal as a hip dining and nightlife scene, ArcWest Partners has purchased the Spanish revival-style marketplace in Mid-Wilshire. 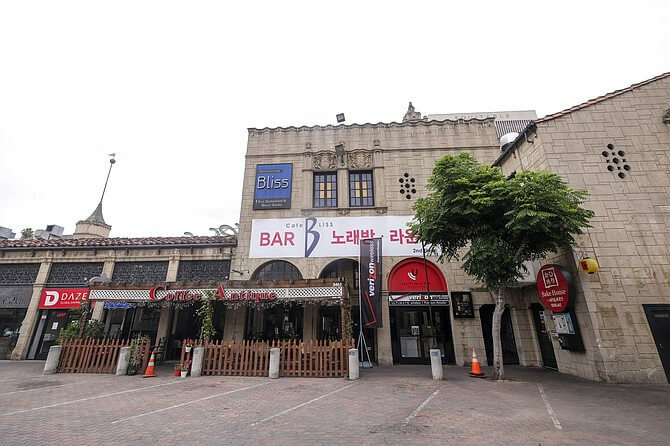 The off-market deal marks a rare sale on Sixth Street, where owners tend to hold on to properties for decades, said Avison Young broker Tony Kim, who has worked in the Koreatown market for nearly 25 years. Kim, who was not involved in the transaction, estimated the value of the property as at least $53 million, or roughly $1,270 a square foot, given its popular restaurants and lounges, plus steady stream of parking income. “This has been the trophy place to hang out for decades,” he said. When Chapman Plaza opened in 1929, Angelenos flocked there to shop for produce. Now, the shopping center’s big attractions are Korean barbecue restaurants such as Quarters Korean BBQ and Kang Ho-dong Baekjeong. The purchase of the historic 1.5-acre site is the first for ArcWest, a Century City-based joint venture between Arc Capital Partners and Belay Investment Group. Allen and Rhone, who had previously worked together at Canyon Partners Real Estate, homed in on Koreatown for its appeal to the millennial crowd as a walkable, bustling neighborhood. “It is probably the most dense and diverse location in L.A.,” said Rhone, adding that ArcWest is scouting for more opportunities in the neighborhood. The firm plans to do a light renovation, cleaning the ornate facades and working with the 20 tenants to discuss other possible improvements. As a city-designated historic monument, the building is protected from major changes, which Rhone said he appreciates. “The Spanish baroque and ornamental style of the architecture cannot be replicated, and set it apart from almost any retail in Los Angeles,” he said. The most recent owner, named on a deed as the JR Irrevocable Trust, is likely a partnership between Kee Whan Ha and Gene Kim, according to sources working in the market.